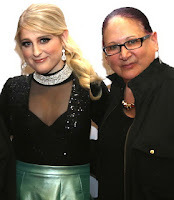 Last year at The Dinah Shore Weekend Palm Springs we were on the Red Carpet with singer Meghan Trainor who won the 2016 Grammy Award for Best New Artist. This appears to be a real phenomena that after rising artists play at this iconic lesbian event that hosts over 15,00 attendees their careers skyrockets. In the last decade the all-girl party has featured Lady Gaga, Katy Perry, Colbie Caillat, India Arie, The Pussycat Dolls, Kesha & more. These are just a few examples of major recording artists that headlined this epic lesbian event while still "unknown" & then systematically went on to hit international superstardom. This year is no exception with Elle King headlining the event that takes place in Palm Springs, California from March 30th to April 3rd in 2016. King who’s hit single “Exs & Ohs” climbed Billboard charts received her first Grammy Nominations in not one but two categories “Best Rock Performance” & “Best Rock Song.” No she didn’t win this year but either did Trainor last year when she went up against Sam Smith. Elle King has toured with James Bay & Ed Sheeran appearing at festivals like Lollapalooza & Bonnaroo & sold out her first two headlining tours. Elle King oozes the kind of raw charismatic talent that leaves you wanting more. It’s electrifying & undeniably best experienced live so don’t miss her Dinah performance. If 2015 was the year she conquered, there’s already every indication that like Meghan Trainor last year 2016 will be the year King will rule the music world. I'm counting down the days til we leave for Club Dinah! !...WHAT A BLAST!